Astro Doughnuts & Fried Chicken will be featuring a "Farewell Obama" and "New York State of Mind" doughnut in honor of inauguration week. Whether you want to drink away your pain or can't wait to celebrate, many D.C. bars and restaurants are offering specials in honor of inauguration and the Women's March on Washington. Here's your go-to list for all the hottest deals. 1905 Bistro & Bar (1905 9th St. NW) will be participating in the All in Service DC event, donating 10 percent of all cocktail sales from inauguration weekend to La Clinica del Pueblo, a nonprofit health center serving the Latino and immigrant populations. Alfa Pie House (1750 H St. NW) will offer an 8-ounce La Colombe drip coffee and freshly made mini phyllo pie for just $1.20 in honor of Inauguration Day. They will also feature two small soups, two side salads and two regular phyllo pies for $20.17. Astro Doughnuts & Fried Chicken (1308 G St. NW) will feature a special "Farewell Obama" doughnut inspired by the 44th president's reported favorite foods, including salted caramels, peanuts and chocolate. During inauguration week, the savory "New York State of Mind" doughnut inspired by the incoming Donald Trump administration will be available. 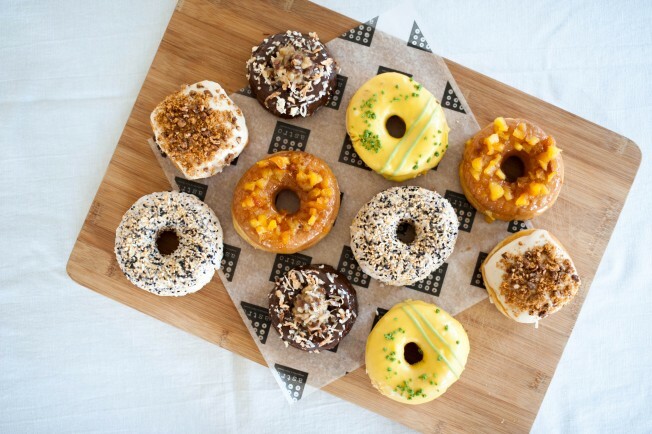 A portion of proceeds of both doughnuts will go to D.C. Central Kitchen. Bar Dupont (1500 New Hampshire Ave. NW) will be offering their inauguration cocktail special until Feb. 6. The cocktail, called A District Welcome, is made from District Distilling Co. Checkerbank Gin, Capitoline Rose Vermouth, Don Ciccio & Figli Nocino, Amaro Montenegro and lemon. Bar Pilar (1833 14th St. NW) will host a Thanks, Obama Send-Off Party with special dishes and drinks inspired by Obama's native Hawaii and Chicago. Throughout the week, the bar will also be holding a raffle as part of the All in Service DC event, with proceeds going to benefit ONE DC, N Street Village and Whitman-Walker Health. Raffle prizes include show tickets to the Black Cat, a "key" to the Rock & Roll Hotel and other prizes from Meats & Foods, DC9 and more. Bayou Bakery, Coffee Bar & Eatery (901 Pennsylvania Ave. SE) will be hosting NBC Washington's live app-cast of the inauguration from its Capitol Hill location. The bakery will also be serving Inaug-u-wich Bacon, Egg and Cheese breakfast sandwiches for $5, as well as vanilla-cherry soda cakewiches for $4.50 in honor of the incoming 45th president. Brookland's Finest Bar & Kitchen (3126 12th St. NE) will tap a keg from women-owned brewery Denizens Brewing Company during inauguration week while also serving $10 White Russians and $10 Orange Russians, with proceeds going to the Chesapeake Bay Foundation. Bourbon (2321 18th St. NW) is another one of many bars donating a portion of their inaugural weekend profits to charity, with theirs going to Planned Parenthood and Martha's Table, a D.C.-based organization that provides food and clothing to families in need. Carmine's (425 7th St. NW) will serve an Inauguration Day continental buffet as well as a sit-down breakfast. This family-style restaurant opens at 7 a.m. and will host an early happy hour starting at 11:30 a.m., allowing you to catch the inaugural parade on one of the bar TVs. Civil Cigar Lounge (5335 Wisconsin Ave. NW) will host a special event Friday from 4 p.m. to midnight. In honor of the inauguration, if you wear a red hat, a tie made in China or a blonde wig, you'll get 20 percent off Jack Daniels and 20 percent off cigars made in Miami. These items will be available for purchase if you forget, with proceeds going to charity. Columbia Room (124 Blagden Alley NW) will feature an all-female bartender takeover Friday and Saturday. The bartenders will be crafting unique cocktails that speak to them and their personal stories. A portion of the proceeds will go to Planned Parenthood. The two-day event will have four seating slots available each evening, with a three-course option at $79 plus tax and a five-course option at $108 plus tax. Compass Rose (1346 T St. NW) will be holding Khachapuri Dialogues over inauguration weekend, with conversations Friday and Saturday nights at 8 p.m. with invited speakers. The bar opens at noon both days; dinner starts at 5 p.m., and drinks are available all night. Coffee and treats will be available at 9 a.m. Saturday. Declaration (804 V St. NW) will be offering customers an Inauguration Day special with two hours of unlimited Brooklyn and margherita pizza, plus American mule cocktails and draft beer, all for $35 per person. Denizens Brewing Co. (1115 East-West Highway, Silver Spring) will be celebrating the Women's March on Saturday by hosting a Nasty Woman Party featuring the release of their new beer, Woman, You Nasty!, a porter on cask with spicy Mexican chocolate. The event will also have a Girl Power movie marathon, as well as music from the bar's favorite female singers. Dino's Grotto Bar (1914 9th St. NW) will open early at noon both Friday and Saturday, with a full beverage menu and a limited bar menu. A percentage of sales from both days will be donated to Casa Ruby, a local charity that provides life-saving service and programs to the most vulnerable people in the LGBTQ community. District Distilling Co. (1414 U St. NW) is hosting a brunch Friday starting at 11 a.m., featuring a comfort food-filled bar menu. The bar and kitchen will also offer all-day menus for the Women's March on Saturday, as well as Sunday. Proceeds from the weekend's special cocktail will go to the local N Street Village Women's Shelter. Good Stuff Eatery and We, The Pizza (303 & 305 Pennsylvania Ave. SE) will be thanking law enforcement during inauguration week in honor of all the officers who have been working for weeks to prepare D.C. for the occasion. During inauguration week, law enforcement officers can indulge in a Colletti's Smokehouse burger, Sunny's Snack Fry and a fountain soda for $10 at Good Stuff. At We, The Pizza, law enforcement officers can get any two slices of pizza and a soda for $8. A badge or form of law enforcement identification is required to get in on these specials. Iron Gate (1723 N St. NW) is offering a new cocktail, We Can Do It!, which aims to highlight local products made by women. Proceeds from the cocktail will go to N Street Village Women's Shelter. Iron Gate will also be offering free to-go coffee for Women's March participants. Logan Tavern (1423 P St. NW) will have free hot chocolate and hot chili soup for those joining the Women's March on Saturday from 9 a.m. to 11 a.m. and 3 p.m. to 5 p.m. They'll also offer a brunch special Friday through Sunday, with proceeds from selected food and drink items going to the Whitman Walker Health Community Center. McClellan's Retreat (2031 Florida Ave. NW) will open early Friday, at 1 p.m. Featuring cocktails from its Top 12 cocktails of 2016 specialty list, the bar will be open late Thursday until 2 a.m. and Friday until 3 a.m. Neighborhood Restaurant Group's D.C. restaurants -- including Bluejacket, Birch & Barley, ChurchKey, EatBar, Hazel, Iron Gate, Red Apron and Red Apron Burger Bar, The Partisan, The Sovereign and Union Market -- will be pouring Bluejacket's special beer, People are People. All proceeds from the beer on Wednesday will go to D.C.'s Immigrant Justice Legal Service Grant Program. Pizzeria Paradiso (124 King St., Alexandria) will have a special Constitutional Pizza through next Tuesday in honor of the Women's March. Inspired by Thomas Jefferson's Revolutionary American Garden, the pizza features cauliflower, herbed lamb sausage and Pecorino, finished with an endive and peanut salad. On Saturday, Pizzeria Paradiso will donate a portion of its proceeds from sales of Denizens Brewing Company's Lowest Lord beer to the League of Women Voters. Rare Sweets (963 Palmer Alley NW) will feature desserts inspired by outstanding American women from Chef Meredith Tomason. This weekend, you can snack on sweets such as Hillary Clinton's Oatmeal Chocolate Chip Cookies, Maya Angelou's Banana Pudding, and chocolate fudge inspired by Amelia Earhart's sweet tooth. Part of RareSweets' proceeds from these items will go to Planned Parenthood. Ripple (3417 Connecticut Ave. NW) will offer half-off bottles of wine as well as a free snack with any beverage purchased at the bar from 5 p.m. to closing Friday. Teddy & the Bully Bar (1200 19th St. NW) is hosting its Inauguration Weekend @ Teddy event. Starting at 11 a.m., the bar will offer a $45 special featuring unlimited glasses of prosecco, American Mule cocktails, and late night bar bites including fries, quesadillas, sliders and tacos. Via Umbria (1525 Wisconsin Ave. NW) will host a cocktail class called Cheers to Powerful Women at 7:30 p.m. Friday and Saturday. True Syrups bartender Matt Demia will lead the class, which will feature cocktails such as the 19th Amendment Cocktail, the Nasty Woman and the Molly Pitcher, all inspired by powerful American women. The proceeds will benefit Planned Parenthood. Guests can register online.